If you’re not attending the Oscars this weekend, but have always wanted to get up close and personal with one of the little golden guys, we’ve got some ideas for you. In fact, you can even hold an Academy Award at one of these stops—a good time to practice next year’s acceptance speech, perhaps? Ellis Island may seem like a curious place for an Oscar statuette to pop up, but there’s a good reason for it—Hope himself immigrated from England when he was just four years old. 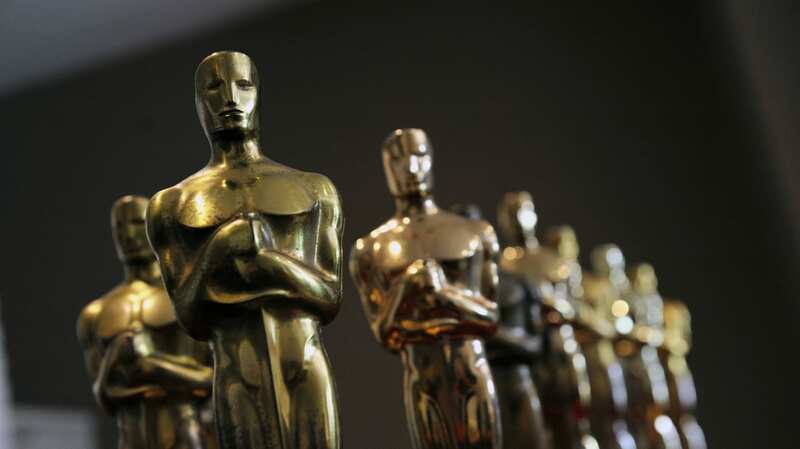 Though Hope never won a competitive Oscar, one of his five honorary awards is on display at the Bob Hope Memorial Library at the Ellis Island Immigration Museum. At the first-ever Academy Awards in 1929, Emil Jannings was the winner of the Best Actor award. The honor might be more celebrated today if Jannings hadn’t returned to his native Germany to shoot Nazi propaganda films during WWII. Nevertheless, you can see the historic Oscar at the Filmmuseum in Berlin, Germany. 4. Katharine Hepburn’s Best Actress Oscars // National Portrait Gallery, D.C.
You can see all four of Katharine Hepburn’s Academy Awards by visiting the “Twentieth-Century Americans” exhibit at the National Portrait Gallery in Washington, D.C. Hepburn’s estate donated the Oscars to the gallery in 2009, along with a portrait of the actress. 5. John Ford’s Best Documentary Oscar // The International Spy Museum, D.C.
Ford won the Best Documentary Oscar for The Battle of Midway in 1942. Two years later, he was at Omaha Beach on D-Day, running the photography unit. 6. Charles Guggenheim’s Documentary Short Subject Oscar // National Archives, D.C. While you’re in D.C. to see the Katharine Hepburn and John Ford Oscars, stop by the National Archives to visit Charles Guggenheim’s. He won in 1964 for his short documentary Nine From Little Rock, about the first nine African-American students to attend an all-white high school in Arkansas. That would be all 26 individual awards Disney received, plus the special statuettes awarded for Snow White and the Seven Dwarfs—a regular-sized Oscar and seven tiny ones. Sixteen years after Shelley Winters won her Academy Award for playing Petronella van Daan in The Diary of Anne Frank, she donated the statuette to the Amsterdam museum. For an Ol' Blue Eyes trifecta, visit the Sinatra restaurant at the Encore hotel in Vegas. They’ve got the Oscar for From Here to Eternity, his Grammy for “Strangers in the Night,” and his Emmy for the “Frank Sinatra: A Man and His Music” television special. The Academy Award MacAvin won for Out of Africa is on display next to her Emmy for Scarlett. AND ONE YOU WOULD HAVE BEEN ABLE TO SEE—IF IT HADN'T BEEN STOLEN. You would have been able to view the honorary Oscar Charlie Chaplin was awarded in 1929, but it was stolen from the Chaplin Association in Paris just last month. If it’s ever recovered, you may eventually be able to see it at the future Chaplin Museum in Switzerland—though it will likely be under very heavy security.